Slavery; Georgia; Savannah; History; 19th century. Freedmen; Georgia; Savannah; History; 19th century. African Americans; Georgia; Savannah; History; 19th century. Amazon.com description: Product Description: In this masterful portrait of life in Savannah before, during, and after the Civil War, prize-winning historian Jacqueline Jones transports readers to the balmy, raucous streets of that fabled Southern port city. Here is a subtle and rich social history that weaves together stories of the everyday lives of blacks and whites, rich and poor, men and women from all walks of life confronting the transformations that would alter their city forever. Deeply researched and vividly written, Saving Savannah is an invaluable contribution to our understanding of the Civil War years. 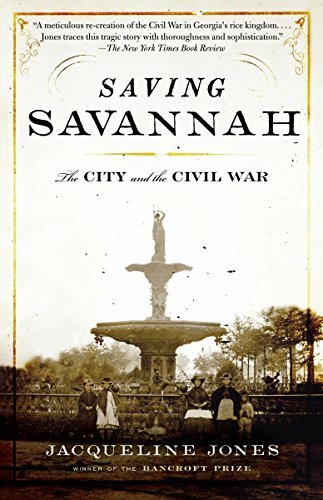 About: A panoramic portrait of the city of Savannah before, during, and after the Civil Warâa poignant story of the African American freedom struggle in this prosperous southern riverport, set against a backdrop of military conflict and political turmoil. About: In this masterful portrait of life in Savannah before, during, and after the Civil War, prize-winning historian Jacqueline Jones transports readers to the balmy, raucous streets of that fabled Southern port city.